What’s new in Qt Tizen Integration 1.0 Alpha 4? Extended support for Tizen IVI 3.0. Qt works with Wayland which is preferred display subsystem on Tizen In-Vehicle Infotainment 3.0. 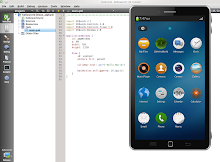 Qt Creator is now centre of the Qt-oriented Tizen SDK. Building and deploying of C++ and Qt Quick apps to devices and emulator is now possible directly from Qt Creator. Integration has been delivered through a dedicated preconfigured Tizen plugin and kits using standard Tizen's build and deployment tools such as Smart Development Bridge (sdb). Handling smartphone sensors has been further improved. Responses to screen rotation changes have been corrected. What’s new in Qt for Tizen Alpha 4? Qt is now delivered through Tizen RPM packages in dedicated repositories. Explicitly supported are Tizen IVI 3.0 (ia32), Tizen Mobile devices 2.2 and Tizen Emulator 2.2. Qt modules and features have been carefully split to packages to make life of hardware integrators easier. There are 300 packages in total! Highly automatized build scripts for Qt on Tizen platforms. Tools from Tizen SDK are reused when necessary. Official version of Qt Creator is used in standard binary form. Automated building also takes care of integration features. Update to recently released official Qt 5.2 Alpha. Final 5.2 is planned by the end of November. It is expected that emerging Open Governance of Tizen 3.0 brings Qt for Tizen and Tizen communities closer and enable direct contributions to the Tizen project. Possible tasks include maintenance of Tizen-compliant Qt packages and testing Tizen emulator for specific use cases. Stability improvements would then land directly in Tizen. Each release of Qt for Tizen is a result of spare time activity of 2 or 3 engineers. Imagine progress that will be possible if communities got more integrated! Improvements in Qt packaging performed in this release already bring benefits to other platforms where Qt is widely used, for example Linux desktop, Android and Mer. Detailed installation instructions have been prepared for application developers at http://qt-project.org/wiki/Build-Qt-for-Tizen. They explain all prerequisites such as installing Tizen SDK and dependencies. The installation process has been tested with Ubuntu/Kubuntu 12 and 13. Further integration between Qt and Tizen specifics and services is already in the works. Qt SDK for Tizen for many Linux distributions and support for Mac OS X and Windows would be added. Our road map is developed in the open. Software development for this release has been contributed by Tomasz Olszak (build scripts, packaging, Qt Creator plugin), Jarosław Pelczar (Qt Creator plugin) and Jarosław Staniek (testing and documentation). Valuable feedback, testing and improvements were offered by numerous other Qt Project contributors. All contributors are listed on the wiki page.